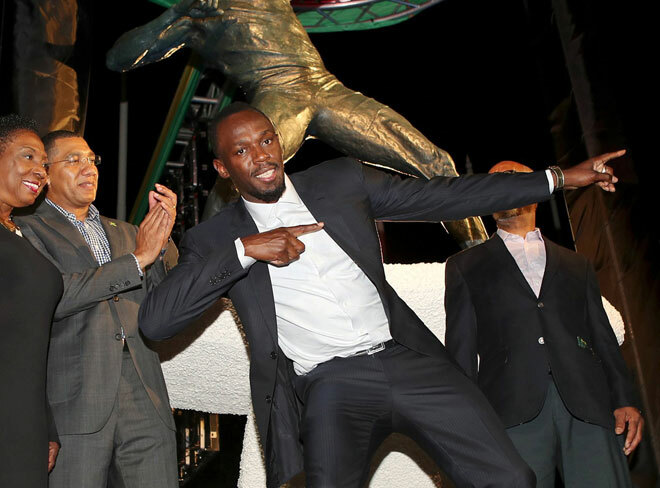 KINGSTON: Multiple Olympic and world champion Usain Bolt has described the unveiling of his statue in front of Kingston’s National Stadium as one of the greatest moments of his career. The statue, commissioned by the Jamaican government and revealed by Prime Minister Andrew Holness, stands in front of the place where 15 years ago Bolt won the junior championships to announce himself to the world. “For me this is up there, it can’t be doubted that this is one of the greatest moments in my career,” Bolt told Reuters after the unveiling on Sunday. The statue was sculpted by Jamaican artist Basil Watson and features the 31-year-old in his trademark ‘lightning bolt’ pose, seen many times over the years as he set world records in the 100 and 200 metres, winning 11 world and eight Olympic golds. “It was all worth it: the losses, the injuries, everything I’ve been through, it’s all worth it,” said Bolt, who signed off his stellar career with bronze in the 100m at the world championships in London earlier this year. Holness has previously said that Bolt’s performances over the years has elevated the status of Jamaican sport. Bolt was stripped of one of his nine Olympic gold medals when his former 4x100m relay team mate Nesta Carter retroactively tested positive for the banned stimulant methylhexanamine at the 2008 Beijing Olympics. Carter has appealed to the Court of Arbitration for Sport against the decision resulting from the doping test. Bolt, the only sprinter to win the 100m, 200m and 4×100 relay titles at three consecutive Olympics (2008, 2012, 2016) until Carter’s test result, was not losing any sleep over the medal missing from his glittering collection.